Successfully Added Apple Watch Charger with Wireless Smartphone Qi Charging Pad: 2 USB Type-C Ports + 2 USB Ports to your Shopping Cart. 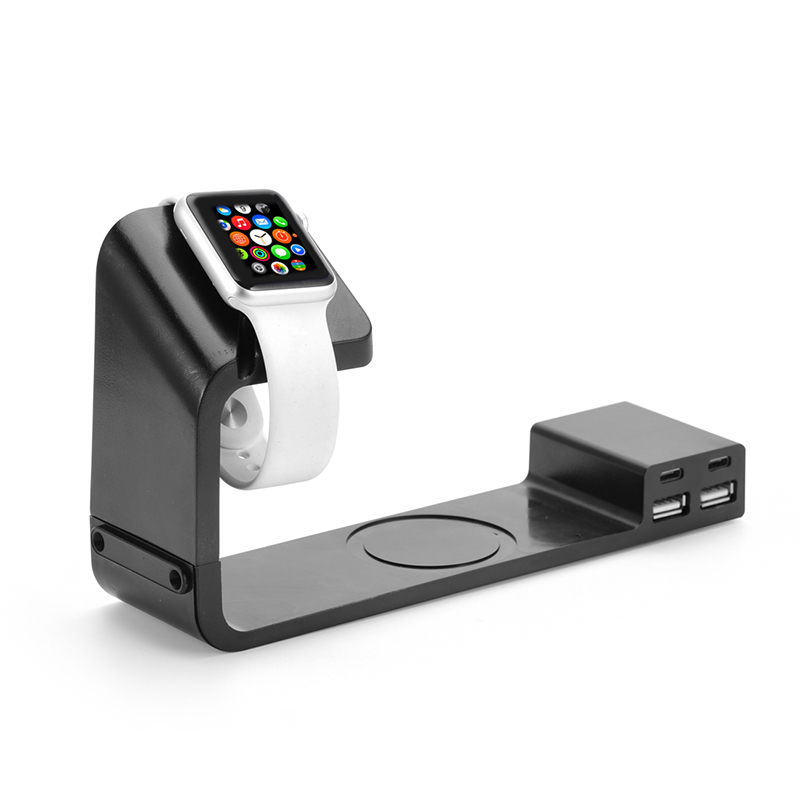 The perfect charging hub to charge your Apple Watch in the most elegant way. Extra Qi charging pad for your Qi enabled smartphone. 2 USB Type-C ports and 2 USB 2.0 ports to stay future proof. Live in the future, today. This multi device charging solution is perfect for the tech-savy consumer in 2016 and onwards. If you own an Apple watch, than this cool device can be the perfect companion on your office desk or bed stand, as it can hold the Apple watch in style, when you don't need it around your wrist. But that's not all, you can also connect your Apple Watch charging cable to the USB port and charge your watch while you're not using it. It doesn't just look good, but also makes sure your iWatch stays scratch free. Besides just a Apple Watch charging dock, this hub at the same time comes with a useful Qi charging pad. This allows you to charge your flagship phone without any cables required. Once you try this yourself you will also find out that your smartphone looks beautifully next to your Apple Watch. If an Apple Watch Charger Stand and Smartphone Qi Charger isn't enough, we've included another 2 USB 2.0 ports and 2 USB Type-C ports. The latter makes sure that you can charge future devices, which more and more of will support USB-C. Of course, you still get the normal USB ports to charge older devices.